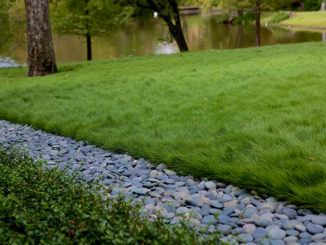 The landscape architecture of the Buena Vista project incorporates style and usability for a modern town home in the urban environment. This small 300 square foot urban garden terrace creates a seamless connection from the indoors to the outdoors. A cast in place concrete table is the centerpiece and focal point of the design. This element is a synthesis of form and function with its crisp lines and mass. 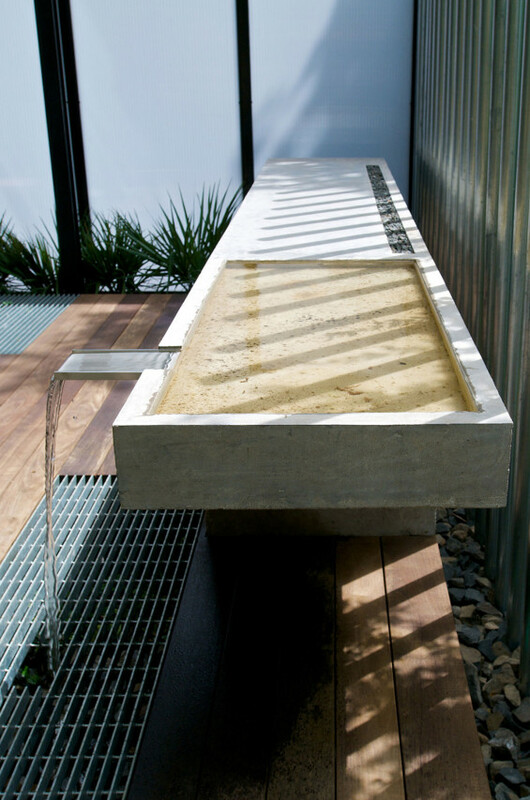 The table has a shallow reflecting pool at one end, and the pool water flows over a stainless steel scupper to a basin below. It also has a slot cast into the rear side, providing a warm fire element during the cool winter months. It successfully anchors the space, while providing the functionality of site-built furniture. 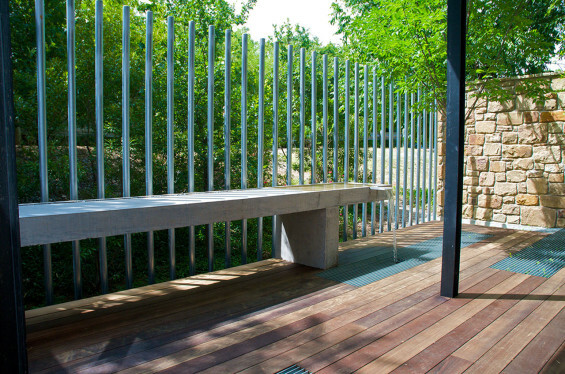 The surrounding deck, constructed of ipé wood, extends from the house and floats above the surrounding landscape. 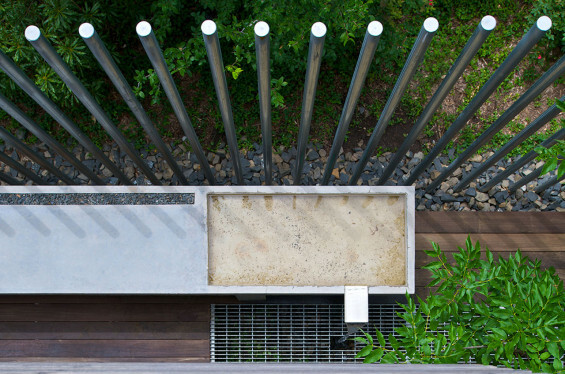 Steel bar grate panels are incorporated into the deck to create visibility to and sunlight for the plantings below. These openings provide visual interest for users of the primary terrace and from the dual levels of balconies above. When peering down onto the deck terrace, the green bands of planting contribute to the overall scheme. 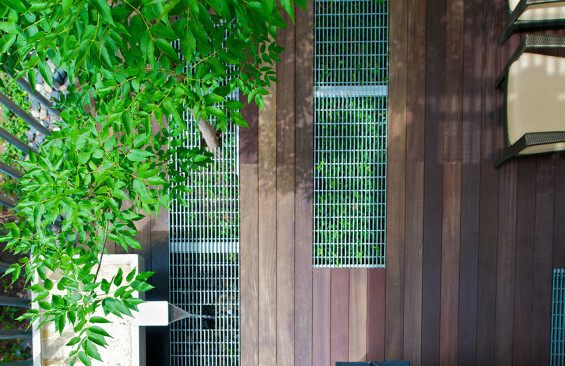 The groundcover in these windows thrives in the microclimate created below the steel grates of the deck above. Privacy is achieved through the use of a steel and polygal panel to separate neighbors without compromising light quality. The translucent panels allow light to filter into the space and create shadow interest throughout the day. 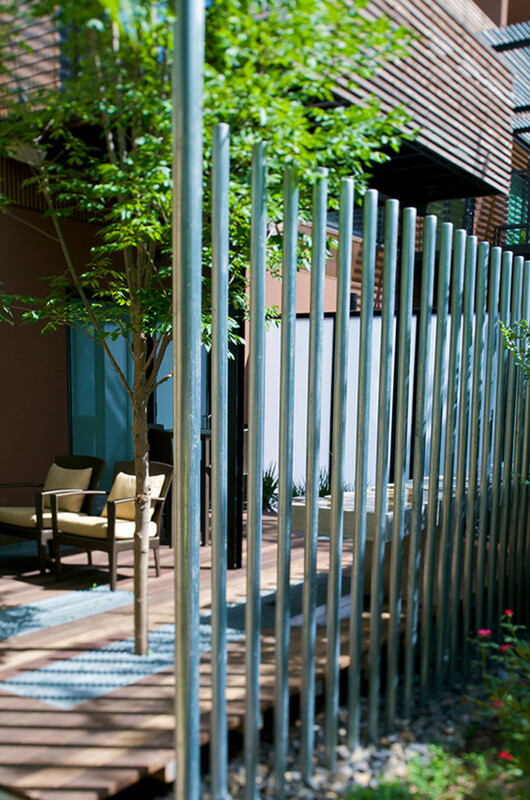 The vertical steel picket fencing allows extended views to plantings beyond and makes the small space feel much larger. 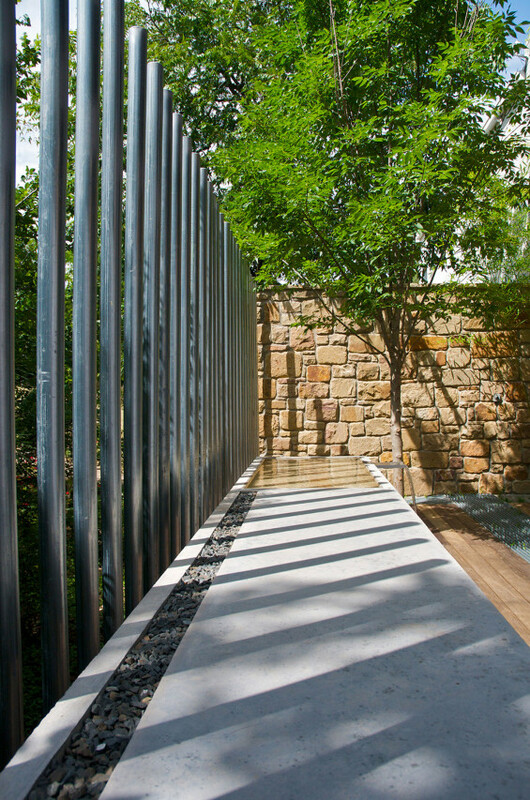 The woodland plantings outside the fencing were specifically chosen to create a very dense matrix of native thicket for screening and privacy. 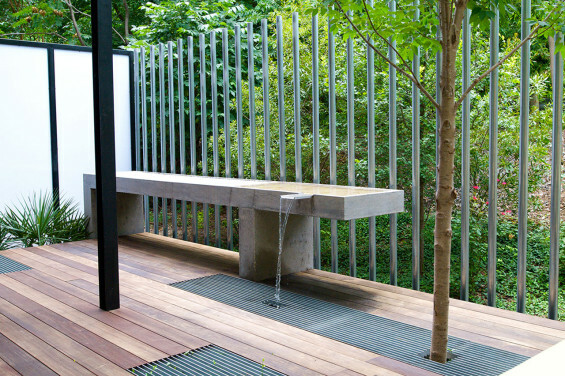 A singular grove of bamboo punctuates one end of the terrace.